When is an IPA not an IPA? When it gets lost in Dubai and becomes a Belgian pale ale instead. 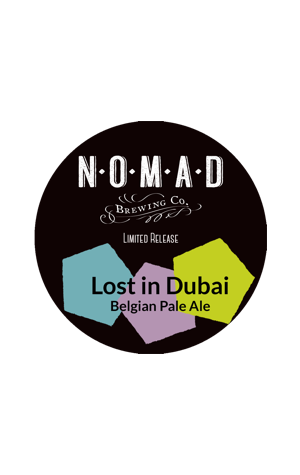 At least, that's the story here, with the Nomad brewing team initially setting off to brew their Jetlag IPA before they changed their minds along the way and "hijacked the beer and instead we had a stop off in Dubai with a Belgian pale!" Why Dubai? Presumably because it's the stop off point between Italy and Australia for this most international of Aussie breweries and why the reference to stopping halfway? Well, they chose to use a Belgian yeast strain that would allow them to finish with a low ABV "small beer" in which the brewer reckons "the fruity notes from both the Belgian yeast and the Australian hops really work well together. If it needed to be arranged in a style I guess I would call it a Belgian session pale ale."